Understanding the Types of Loose Tea that are available will help you choose the best teas for your particular tastes and desired experiences. We will discuss their descriptions, origins, and food pairings flavorings to help you determine which ones you will like, their benefits and why organic teas are so important. Fermentation is a chemical reaction in the presence or absence of oxygen, oxidation, as the name implies, is a process requiring oxygen. In simplest terms sugar converts into acid or alcohol. Think yeast added to a watery barley solution resulting in beer. Oxidation is also called food browning or enzymatic browning. Phenols in teas and coffees change upon contact with enzymes in the plant and oxygen. Resulting brown pigments are melanins. High dry heat, steam or cold water will affect and cancel oxidation. Tea Masters only gain such knowledge after years of apprenticeship. 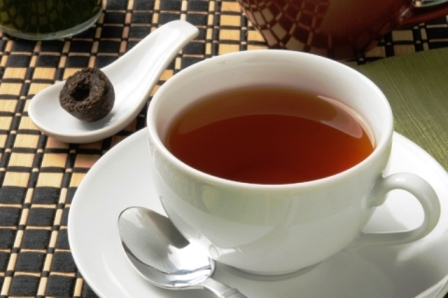 Black Teas are the most consumed in the world and typically known for a robust aroma and flavor. This tea is fully oxidized by using rollers and crushers to expose more of the tea surface area to atmospheric oxygen. Low heat increases enzymatic activity whereas high heat stops activity by destroying the enzyme protein. 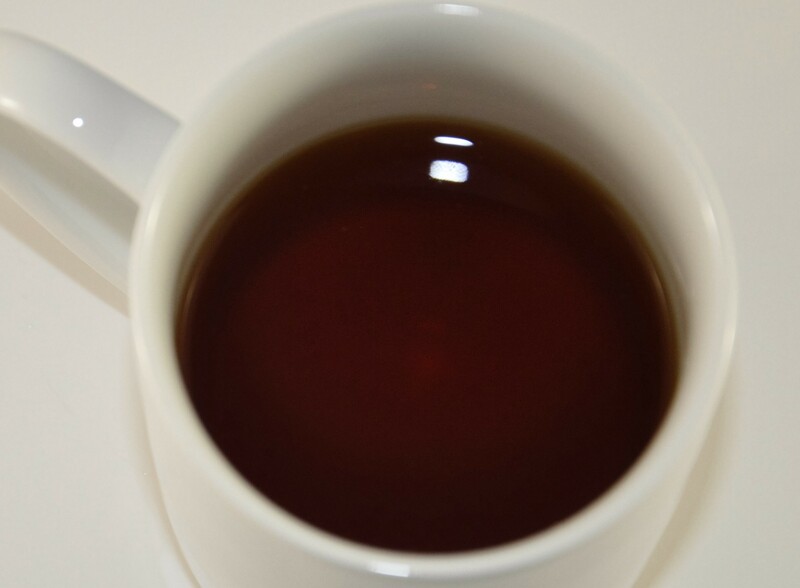 Cooked the most, black tea contains less antioxidant activity than green tea. At a specific time as determined by the tea master, the leaves are “fired” to stop the oxidation process. The tea is now sorted into various grades and blends for the customer. The tea has notes of tannins, chocolate and earthy tastes. The tea liquid is reddish, hence in China it is known as “red tea”. Sri Lanka and Kenya export the most of this tea. With our famous Embassy House Teas© Earl Grey blend, the tea is combined with the oil of bergamot and with Chai our tea is combined with cinnamon. Our recipe uses both buds and stems as a small percentage by weight to add unique color and taste. 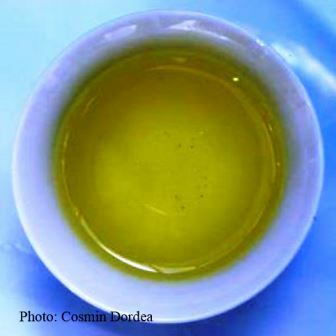 Of all the types of loose tea, the goal of green tea processing is to minimize the oxidation of the plant. This can be done with high heat and/ or steam. The leaves are rolled and “fired” to stop oxidation. Taste is typically “plant like” (vegetal) but mild. Minimally processed, these green teas contain concentrated amounts of antioxidants called polyphenols. These teas are typically referred to as “superfoods”. Historically it seems that this method was the first used by Chinese around the 6th century BC for taste and preservation. China exports the most of this tea. At Your Loose Teas, we grow our organic green tea using many of the old Chinese methods. 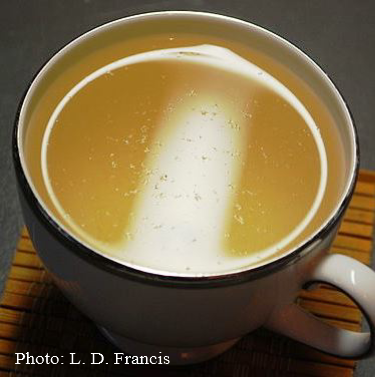 Made primarily from tea buds, white tea is the least processed and, therefore, the most nutritious. The tea creates a yellow liquid. It is called white due to the down-like hairs that cover the buds and young tea leaves. It is steamed and dried immediately after plucking. The final steps are rolling, shaping and drying. Taste is mild, less vegetal than green tea. Some have described the vegetable taste closer to squash than to grasses. Note the extremely fine, down-like, hairs in the tea liquid in the adjacent photograph. 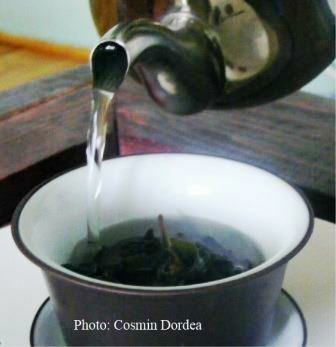 A mid oxidized tea, most believe its taste is between black and white. 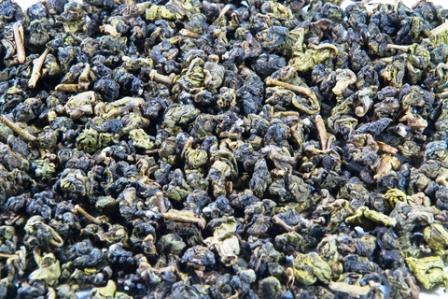 Fresh tea buds and leaves are withered lightly before rolling. A final firing halts oxidation. A unique part of the process involves tossing the leaves and bruising the edges, limiting oxidation to these areas. 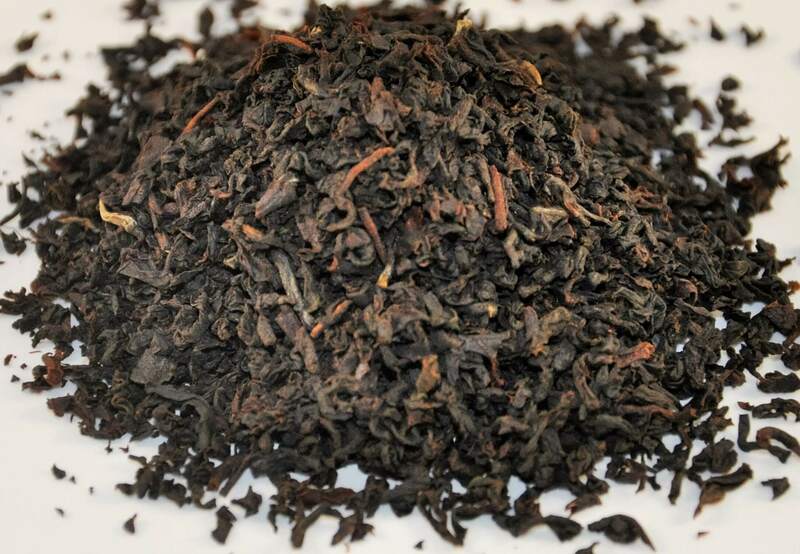 When talking about types of loose tea, it still seems odd to refer to Oolongs as a blue tea. The tea leaves are older and deeper green than young leaves. 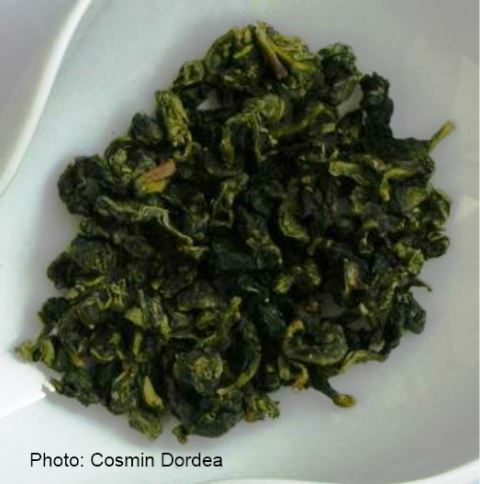 Oolongs are very diverse in taste and aroma depending upon the processing. 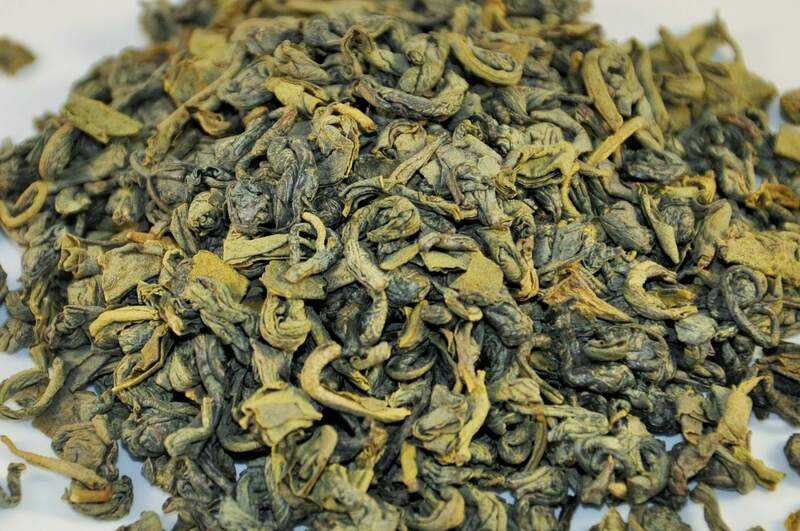 Typically the taste is seen as more mellow than green or black teas. Some oxidation occurs during a short weathering stage. Actual fermentation occurs in this process where the naturally present bacteria and fungi on the leaf provide the metabolic reaction. Teas are kept in covered piles to promote biological activity as a gardener would create a compost pile of vegetable scraps. The tea master determines the end of process. The masters mold the final product into balls, bowls or wire like shapes. 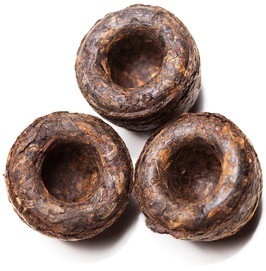 Many agree that Pu-erh is a very complex taste. Reviews vary by fermentation time, by region grown, and by the age of the tea plant. This variety is becoming rare due to extensive manual labor and skill requirements both in plucking and processing. Only buds are plucked early in the growing season. The freshly picked buds are heated quickly, wrapped in special paper, and stored in wooden boxes. The process is repeated over three to four days. Finally, the tea master slowly roasts the leaves to a yellow color. 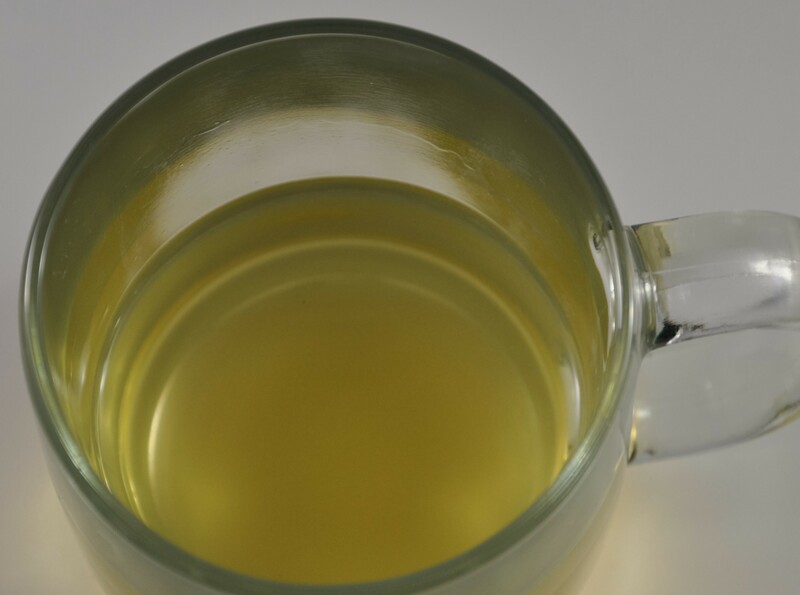 Very similar in taste to green teas, though many consider that it has a longer aftertaste. Of all the types of loose tea, this variety is very rare to find with the vast majority of supply coming from farms in China.